If you are interested in magic, you’ve come to the right place! The Conjuring Arts Research Center has over 15 thousand books on magic and related fields going back to the 1400s, many that are unavailable elsewhere. Additionally we try to keep up to date on all the latest and are well acquainted with many of the top magicians in the world. Learning the real secret and how to perform this effectively will take some time, but, if you follow along with any nine cards and perform all the actions in the video the effect will work! Due to an amazing mathematical property, the selected card will always end up at the 5th position! Since we are a non-profit, we function solely through the generosity of others. If you liked the effect, please consider donating or perhaps purchasing some of our products! While videos offer a quick way to learn a few things, you will quickly find that many of the best secrets can only be found in books. Books offer the opportunity for you to use your own imagination to fill in the details and to make each effect your own. Additionally they offer a look backward into the history of the art where you can unearth some magical effect that hasn’t been seen in centuries! Soon we will have The Book of Powers available, which will be the perfect book to get started on the path to miracles! It has been authored by Allan Zola Kronzek, author of that great book for beginners The Secrets of Alkazar amongst several others. The book will be a companion to our teaching program, but we think it will be of exceptional value to anyone interested in magic. Currently we offer The Secrets of Alkazar as a convenient ePub! 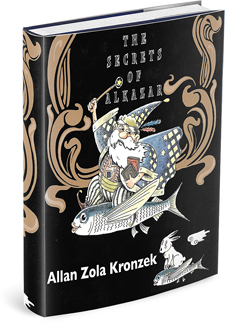 One of the very best introductory texts in magic, The Secrets of Alkazar is one of the few books that really emphasizes the important points beyond the secret that really make the magic. We love this book at Conjuring Arts, it has been of immense value to our Hocus Pocus Project, and are very excited to be able to offer the digital version! As an added incentive to start your journey, Conjuring Arts is proud to offer a free eBook, Howard Thurston’s 300 Tricks You Can Do. Howard Thurston was a very famous magician during the late 1800s and early 1900s. He released several books for the public featuring great collections of quick, effective, and simple magic tricks and stunts, the best of which have been collected for this book. While it is an older book, we think you will find that the contents are still just as perplexing and mystifying as ever. One of the classic books on magic accomplished, as the title suggests, through sleight of hand. This book runs the gamut and is very entertainingly and informatively written. This book is one of the first books to include photographs and you can see some of the best practitioners of the time performing their best creations. Another classic text on the magical art. This has many excellent effects with cards, coins, balls, eggs, handkerchiefs, and after dinner tricks. A great primer on sleight of hand magic for beginners. It is very clearly written and in a fun and entertaining style. The Tarbell Course is the classic series on magic to take you from beginner to professional. You will learn all kinds magical methods as well as some magic history and also all the theory and tips to make allow you to perform your magic at the highest levels. This is the classic primer on magic with playing cards. It goes from beginner to advanced in a logical and easy to follow manner. If cards are your thing, this book is a must. If you are looking to advance and don’t mind spending a little extra money, we would highly recommend getting the Card College series by Roberto Giobbi. The first two volumes cover most of the things you will need to get a great start, and, if you still want more, get the other three volumes! Jean Eugène Robert-Houdin is known as the Father of Modern Magic and was exceptionally influential, including inspiring Houdini! This book will not teach you any tricks, but it is the autobiography of this great magician and will give you insight into what it is like to be a magician as well as provide incredible inspiration to improve your art. Robert-Houdin was the magician that inspired the most famous magician of all time, Harry Houdini, and was also the inspiration for Houdini’s name. Learn More About Harry Houdini! This collection from the 1940s/50s features magic by some of the best and brightest magical performers. It is remarkable in that the series features exceptional photos and clear extensive instructions for some of the best magical creations to date. Do these great miracles as is or let them be your guidelines for making your magic the best it can be! Whether you do it in person or on-line, a magic store will offer many astounding effects, help in selecting the right thing, and have a wide range of instructional videos and books, as well as props and supplies. If you are in New York, Tannen’s and Fantasma are recommended! In the United States there are two main organizations for magicians: The Society of American Magicians and The International Brotherhood of Magicians. You may find that they have meetings in your area and you can attend and learn from other magicians. Look out for magic shows in your area. There are magicians that perform in large theaters, comedy clubs, and even at many of the nicer restaurants and bars. You can also hire a magician for most events to make it extra memorable and amazing! We hope that you’ve found what you were looking for or at least now know where to look!